The Columbia Basin was dusted only with sagebrush and bunchgrass before settlers harnessed the power of the mighty Columbia River. With irrigation came the small town of Richland, and its sister towns of White Bluffs and Hanford. On the advent of U.S. involvement in the Second World War, Richland was discovered by government scientists. Breaking ground in March of 1943, through one of the fastest-built government operations ever, the first nuclear reactor went "critical" in September of that year. Most of the workers did not understand what they had produced until after Nagasaki was destroyed. The local paper announced, "Peace! Our Bomb Clinched It!" 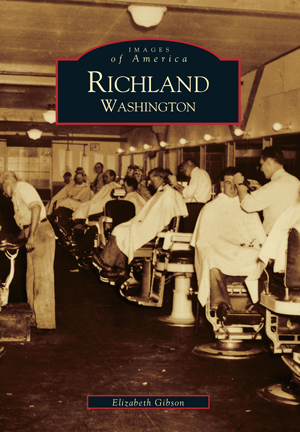 This book, the first to cover the history of the small town that played a part in one of the most earth-shattering events of United States history, captures the people and events that have shaped Richland's character, including the Flood of 1948, the Atomic Frontier Days Festival, the relocation of the town to make way for the Hanford site's construction camp, and pictures gathered from Richland Bomber alumni. Elizabeth Gibson, a third generation Hanford worker, has published two books and dozens of articles on the history of America's western frontier, as well as worked as an editor for the East Benton County Historical Society publication.